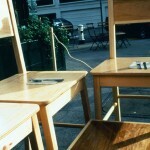 On December 12, 2001 I ran a sidewalk cafe at a local restaurant in San Francisco. 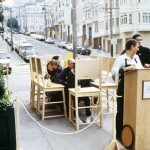 Patrons were invited sit on an undersized table and eat off of one of the eight oversized chairs that I constructed. 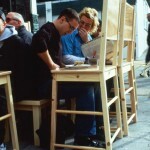 Due to the size of the table if the diners were to be comfortable they had to rest against the persons back that was behind them. I hired a waiterss and I performed/worked as the busboy in my “uniform”.